It takes a special horse to learn how to do tricks, and an even more special one to be good at it and have the conformation and style to win in the show arena. Mego, one of the newest stars of Walker: Texas Ranger, is one of those rare horses that is both intelligent and beautiful. 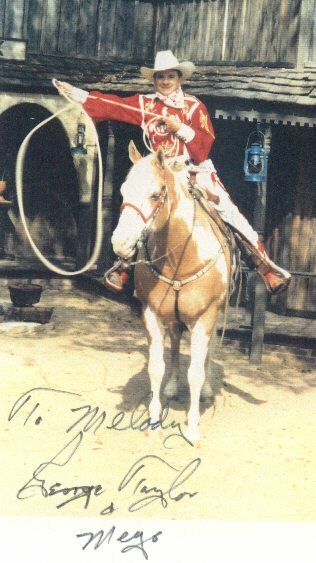 Billed as a "Wonder Horse" by his owner/trainer, George Taylor, Mego started out as a show prospect. He competed in American Paint Horse Association sanctioned shows, earning all but two of the points needed to complete his Championship. Then, George purchased Mego as a pony horse for use with his racing Thoroughbreds and Quarter Horses. It wasn't long, however, before George realized how special Mego was and decided to train the paint gelding as a trick horse. While George had a lot of experience as a trick roper and had even trained a Brahma Bull for rodeo acts, he felt Mego needed just a bit more experience. He called up his friend, Rex Peterson, for advice. Rex willingly passed on his knowledge, including many secrets learned from Glen Randall, the famed trainer of Trigger. The results were spectacular. Within approximately six weeks, Mego learned most of the thirtysome tricks he performs. George hastens to point out that this approach is not for everyone. "Most people ask for advice," he said, "and then don't follow it. I did exactly what Rex said. I didn't add anything and I didn't take anything away." George and Mego took their act onto the road. With George's background in rodeo, one would expect them to perform there, but George found a very different sort of audience. He and Mego work business conventions, performing for IBM, State Farm, and even, Ross Perot. As many of these events are held at upscale hotels, Mego wears rubber horseshoes to prevent his hooves from damaging the floors. "And," George adds, "Mego is house broken." Then, in October, 1993, Mego auditioned for the part of Walker's horse on Walker: Texas Ranger. Chuck Norris was taken with the palomino overo and immediately had Mego written into the next available episode. This was halfway through the season, but the scriptwriter made the changes and Mego's first episode aired November 20, 1993 on CBS. Filming the series is hard work. A typical work day (for the human actors, at least) lasts 16 hours. It takes six of these grueling days to put out a single one hour episode. In between film engagements, Mego still performs with George at conventions, dazzling the audience with rears, bows, and even, rope spinning! As George says, "Mego is the smartest horse I've ever had." Besides that, he's beautiful.